Mini-muffin modifications added below on October 29, 2012. Enjoy! I don’t remember what precipitated the discussion, but somehow it came to my attention via dh that dd really wanted to have chocolate chip muffins for breakfast. We’ve taken to keeping the Entemann’s Chocolate Chip Mini-Muffins in the house, mostly because they’re easy to whip out if you need a quick breakfast on-the-go, and ds has taken to them like a fish to water. But dd hasn’t really fallen in love with them, and she wanted a WHOLE muffin that she could eat…well, whole…rather than four small muffins that had more the appearance of a snack than a single baked good. Poking around in our cookbooks, I noted the distinct lack of a specific “chocolate chip muffin” recipe, although I did find a banana chocolate chip one that would’ve worked great – had dd not turned her nose up just the other day when presented with a banana chocolate chip muffin purchased from the farmstand. Fine. I’ll bake them myself. On a really hot day. Don’t go handing me a “Mother of the Year” award just yet; we have central air conditioning. On second thought, go for it: I followed baking these with whipping up a batch of oatmeal chocolate chip cookies (because I’m a good wife sometimes, too). A note: this recipe was inspired by a recipe that I found in a cookbook. If you want the full cookbook, please, by all means, go buy it. It’s awesome. I will be attempting further mods on this recipe sometime soon, with fewer chocolate chips (because dh thinks there were too many – and I think that’s just NUTS) and using some vegan mods, like darker chocolate, applesauce for at least one of the eggs and margarine for the butter. When I get around to testing the other mods, I’ll post if it all works out nicely. 2. In a mixer, cream together the butter, sugar, salt and vanilla. 3. Add the eggs singly, beating well after each is added to the bowl. 4. While the mixer is going on low speed, add the baking powder, and then alternate adding 1/3 of the flour and 1/3 of the milk until all the flour and milk have been added to the bowl. 5. Turn off the mixer, then add the semi-sweet (regular size) chocolate chips to the bowl. Stir well to combine. 6. Put a muffin liner into each of 12 cups in a muffin pan, then scoop the batter into each of the muffin liners. You should have enough to fill each one fairly full (and it’s okay if it’s all the way up to the top). 7. 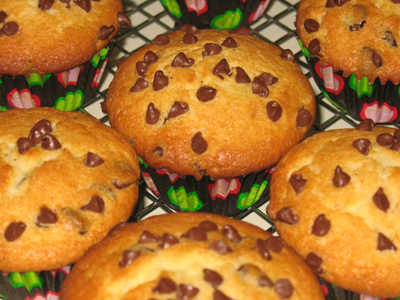 Garnish each muffin with a sprinkling of the mini chocolate chips, then put the muffins into the oven. 8. Bake for 30 minutes, or until a tester inserted into the center two muffins comes out clean. 9. Cool in the pan for 5 minutes, then remove the muffins from the pan and place on a cooling rack to complete the cooling process. JOY in bite-sized form factor! Using the same set of ingredients, you can make 48 mini-muffins. In theory, it still makes about 12 servings of 4 mini-muffins each. How you observe this serving size in reality…I leave up to you. To make these as mini-muffins, follow instructions 1-5 (above) and then fill 48 mini-muffin cups with the batter. If not using mini-muffin liners, just spray the pans with a baking spray before filling the cups. Bake for 20 minutes. If you have two 24-mini-muffin pans, as I do, put them on separate racks and swap them halfway through cooking time. No need to cool these in the pan before moving them to the cooling rack; simply turn them out onto a cooling rack, let them cool a bit and then try not to eat them all in single bites. It’s very, very hard not to eat these in single bites. Really. Full disclosure: I’m an omnivore, but I have an appreciation for vegetarian and vegan cooking, thanks to having friends who have these more restrictive diets (by choice or necessity). As I have done more entertaining for friends with a variety of dietary restrictions, I’ve had to adjust some of what I put out on the dinner/buffet table so that I’m taking out everything from animal products to things with latex (bananas & kiwis), and that’s kept me on my cooking toes. More recently, I had my annual physical and my doctor cautioned me that she was starting to get worried about my cholesterol. Ah, crap. Her advice to me included cutting back to the minimum on dairy. HOLY CRAP. I HAVE TO GIVE UP MY REGULAR CELEBRATION OF ICE CREAM O’CLOCK?! There has to be a better, way, right? It’s not like I eat a ton of red meat; easily three-quarters of the time, the meat in my meal is fish or poultry. So, this made me think that perhaps I should look at other ways to reduce cholesterol where possible. And, having a VERY CHILLY Sunday afternoon that wasn’t consumed with running errands, I thought it might be fun to stay inside and bake. I started with a tried-and-true recipe that came courtesy of my friend, Cyndy, of DailyCynema, and I made a couple of modifications. Feel free to check out the original recipe here. And check out her other recipes, too. She’s a damn fine cook, and she’s really sweet about sharing. To make this recipe TRULY vegan, make sure that A) your margarine is 100% free of dairy [we use a Fleischmann’s version that is completely lactose-free], and B) you use dark chocolate that’s considered vegan. I used Hershey Special Dark chips, but those have a small amount of milk in them, so that’s why this recipe is only nearly vegan. 2. Put the first four dry ingredients (flour, baking soda, baking powder and salt) in a bowl and stir briefly. Set aside. 3. Mix the first three wet ingredients (margarine, white and brown sugars) on low speed in a stand mixer or by hand, until all items are well combined. 4. Add the vanilla, maple syrup and applesauce and mix/stir well to combine. 5. Add the bowl of dry ingredients and mix/stir well to combine. 6. Add the oatmeal and stir well to combine (best to do this by hand, to make sure the mixture is even). 7. Add the chips and stir well to combine. 8. Place rounded tablespoons of the cookie batter onto a non-stick baking sheet, about 2 inches or so apart. 9. 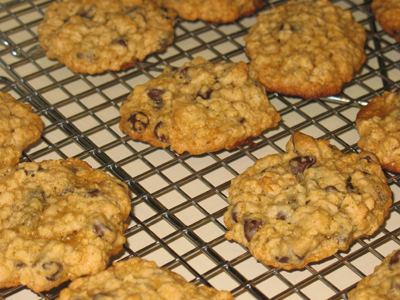 Place the sheet in the oven and cook for 12 minutes, until the cookies are slightly brown on the edges and bottom.